I don’t know what it is about wildflower meadows that are so appealing, but I for one love them! Maybe it’s just the gorgeous mix of simple flowers or the fact that they attract so much insect life – or maybe it’s just a bit of old-fashioned nostalgia. Either way I know I’m not alone, as I’m finding that more & more of my clients are interested in dedicating areas of their gardens to growing wildflowers – even if on a relatively small scale rather than going the whole hog and turning over large swathes of land to meadow. The wonderful thing is that as more seed and turf companies appreciate the current popularity for wildflower planting, the more accessible it’s becoming for all of us. Plants are now available as seed mixes, miniature ‘plug’ plants to grow in existing turf, or even as ready-made rolls of turf with the seed already in them and which can simply be rolled out like a carpet. 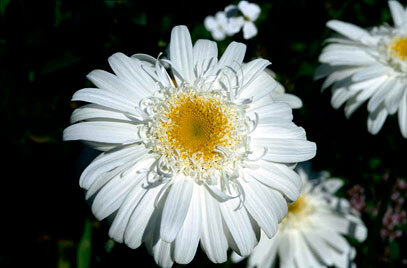 You can choose from a range of native wildflowers or go for non native species to extend the flowering period. It seems that pretty much anything is possible to suit all budgets and abilities – as long as you understand from the outset what is involved. The key is to decide whether you want to simply grow a mix of annual flowers or whether you are looking for a traditional long-term meadow made up of a mix of grass and flowers. Once that decision has been made it’s of paramount importance to understand your garden conditions – in particular soil type and fertility, but also light and moisture levels. Annual ‘meadows’ are exactly that – ie they last just for one year (but on the plus side they don’t take a great deal of work to put in place). Preparing the ground any time from autumn or early spring, it’s vital to clear the soil of any grass and weeds to begin with, then it’s just a question of raking over the soil to create a fine tilth, and then sow away. When the flowers are over, to ensure a good balanced mix of flowers for next year it’s generally best to start the process again from scratch (removing any trace of the plants). For that reason annual meadows are probably best for small areas of ground. You do also have the option to strim off the growth and leave it on the ground for any remaining seeds to fall, and then let nature take its course. 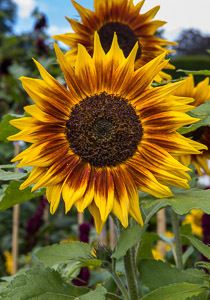 You will inevitably get some flowers popping up the following year from self-sown seed, and you could just top those off by adding extra seed to fill the gaps. If you prefer to go for a perennial meadow (one that will come back every year) there’s more work involved in terms of preparation and initial management, and it’s vital to make sure there are no weeds in the ground which will swamp the meadow grasses and flowers as they come up. This may involve zapping the area more than once with a herbicide such as glyphosate, to be certain that the ground is clear before sowing seeds. Generally perennial meadows are much more successful if grown in poor soil, so that may mean stripping off a layer of top soil to provide the right conditions. Having said that, there is a wide range of seed mixes on the market with suitable plants in the mix to succeed in different site conditions, so it’s worth investigating the options. 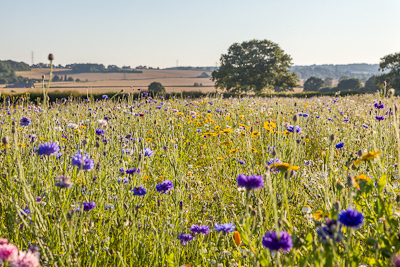 Depending on soil fertility, it could take up to 5 years for a perennial meadow to establish, so it’s not the easy option many people imagine it to be! Once that point is reached though, managing it will basically be a question of cutting and raking it once a year, with a little spot weeding as required in spring time. Do bear in mind though that no two meadows will grow in exactly the same way or at the same rate, and the mix of flowers and grasses will vary year on year (especially given the vagaries of the British climate!). If that all sounds a bit complicated and you just want to get the look without embracing the wildflower meadow wholeheartedly, you could simply let your existing grass grow long and in time wildflowers will appear. I love this look in orchards particularly where paths can be mown through the long grass. It’s a lovely way of creating areas in the garden which look more natural, and in rural areas it’s a perfect way to blur the boundary between the more formal ornamental part of the garden and the countryside beyond. And it’s up to you to decide how long you want your grass to get – even if it’s just a few more inches than the path it can look very attractive. Add a selection of spring bulbs such as Daffodils into the turf and it’s a winner! But if you’re interested in creating an area of meadow in your garden and would like to investigate it further with our help, then of course we’d love to hear from you. Just call 01730 261712.